“Pacific Rim” – A Brief Christian Reflection | J.W. Wartick -"Always Have a Reason"
Thankfully, a slew of science fiction films are being released this year. “Pacific Rim” has generated quite a bit of buzz. I recently had the chance to view the film and will here offer some reflections from a Christian perspective. I feel obligated to put a disclaimer here: I realize this film is 99.9999% about blowing things up. I still think that a saying I often use is correct- there is no such thing as a film without a worldview. There will be SPOILERS in what follows. I do not offer a plot summary, as one can be found easily. Early in the film there is a scene in which Raleigh Becket, a Jaeger (think giant mech-tank) pilot, is marching out into a storm to fight a Kaiju (think Godzilla). As one watches this epic man-made titan march out to fight a monster, one is struck by the hugeness of it, the power of it. If humans can make this, what next? Raleigh discusses how once, humans were afraid of storms like hurricanes. Now, given the might of their creations, they need not fear a hurricane. The quote seems impressive. After all, many today hope that humanity will reach heights like this. One day, we may be able to face down a hurricane and laugh. The powers of wind and rain may be overcome. But what then? Interestingly, in the film the very next scene is that of a Kaiju absolutely beating down Raleigh’s Jaeger. What? That’s not how the story is supposed to go. The story is supposed to show how we have finally transcended ourselves. But that is not the reality. The reality is that a giant Godzilla beast can still destroy even these hurricane-defying machines. …Will it keep begging you for mercy? Ultimately, God is in charge. Our attempts to control the seas, the storms, or the leviathan do not match up to God’s sovereign control over all creation. The film does nothing to explore this avenue, but one can wonder: what of humankind’s efforts to try to best God? It seems that the answer is: it’s not going to happen. There is always a bigger Kaiju. There are always larger storms. Our fascination with these powerful aspects of creation may itself be a reflection of the Creator. In the film, of course, humanity triumphs. As in all good action movies, the good guys win (no, I do not like sad endings for movies). But one can only wonder: if the Kaiju could come; what next? The God who rules the storms is the same God who can draw the leviathan with a hook. How much can our minds handle? In the film, the mental strain of piloting a Jaeger is too much for one person to handle. How do minds work in this context? Somehow they manage to create some linkage between two humans’ minds and create some kind of mental pathway such that the people are able to integrate and work together. What does that mean? I don’t know. It is techno-babble for an action flick. But suppose we were able to do this. What would it imply about minds? Well, no more than what we already know, it seems: our minds are connected to a physical reality. We as humans are grounded in embodiment. The Kaiju turn out to be clones. I found that pretty surprising given the immense diversity of the creatures. Some had wings; others spit acid; still others had huge hammerheads to use as weapons. What kind of genetic diversity would have to be included in their DNA in order to allow for such radical diversity. I am absolutely not a geneticist–and this movie is absolutely not an attempt to portray anything scientifically accurate–but I wondered about this as I watched the movie. Let’s be blunt. 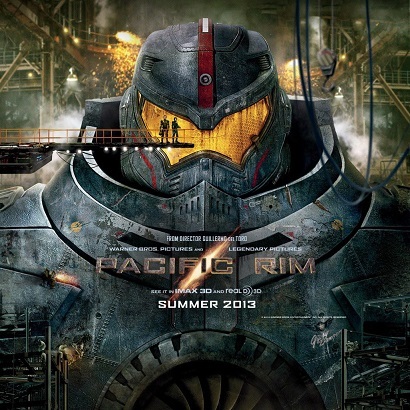 “Pacific Rim” is a movie for those who want to watch giant walking tanks fighting Godzilla clones. There is a plot to be found, and there are some themes involved–as in any movie–but at its heart, this movie is a pure action flick. That said, there were a few things to reflect upon, such as the notion of humanity trying to overpower God or the forces around us. Did you like Pacific Rim? Check out John Carter. Be sure to check out my other looks at movies here (scroll down for more). well done! I always enjoy your reviews and wondered where this one would take you. And the fishhook with a Leviathan was perfect. As to the mind merge, I find an interesting comparison with a marriage – two becoming one and working as one unit throughout their lives…as a couple…as parents…and found it appropriate that occasionally that mind merge goes out of sync when one mind drifts from its focus. It seems an apt image for our world where too many relationships get caught up in that drift as they let go of the focus on each other. NOT that I think this movie was about marriage LOL. a TRUE action flick!!! The movie is clearly about marriage. Kidding, of course… Very insightful observation regarding the marriage parallels.